Guess I'm just used to the pauses at this point. It's kinda silly, but I really enjoy the achievements as fun little side goals to shoot for, especially when a game gets into the "mopping up" stage. 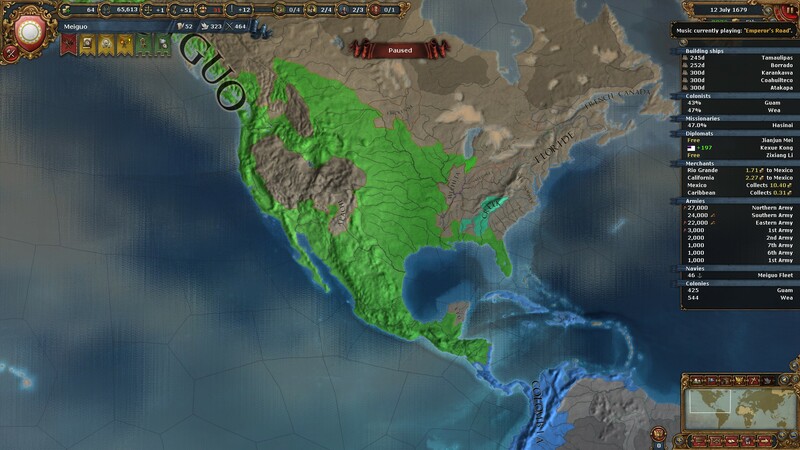 When you say the colonial game, are you mostly referring to North and South America with the colonial nations? 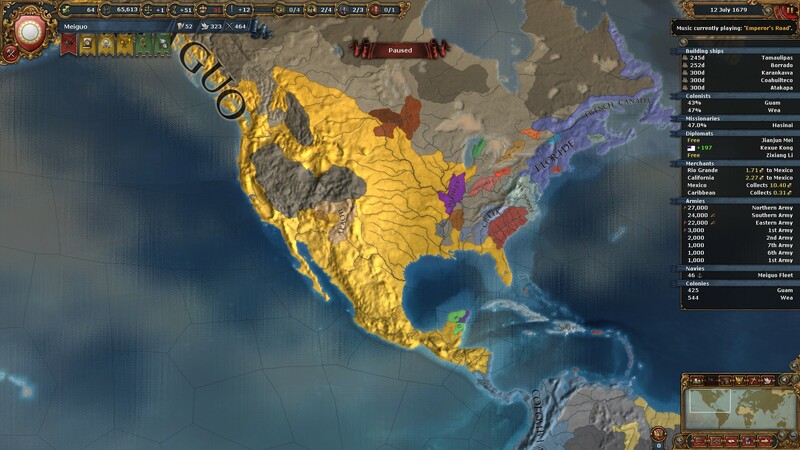 I haven't played a game colonizing the New World since the expansion that introduced them came out, so I don't have too much to offer. The colonial nations seem to have some neat ideas, but I could see the execution ending up in an underwhelming place. The African and Asian colonial system is by far the best it's ever been, though. Well worth trying out if you haven't since trade companies came out. Nice empires, tboon and Gunner! I just finished up a custom game that I started when Common Sense came out (for most of that time, it's been on the back burner due to RL). It's only 1679, but I've hit the point of diminishing returns. Nobody near me is a threat, I've fulfilled my goals for the game, and I don't have the appetite to blob further. 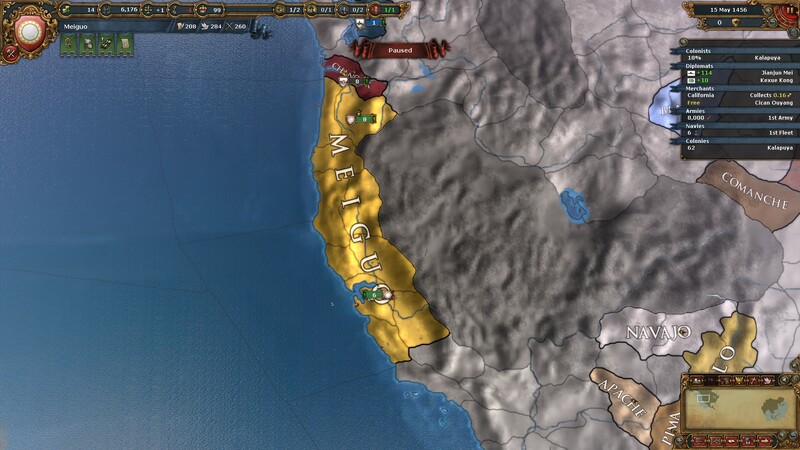 This is how I started - Meiguo, a Chinese nation that I set up on the western coast of North America. I find this game so intimidating. Maybe should give it another shot. Very cool, Peter. Enjoyed your write-ups on the blog for that game. - New Diplomatic Options: Let the world know what you think of your neighbors by setting a public attitude to foreign powers. - Tell The World What You Want: Designate neighboring provinces as “places of interest”, build trust with other nations, and entice allies with the promise of land for their support. - Tengri: Tengri is now a Syncretic faith, allowing it to tolerate a secondary religion as if it were a national faith. - Improved Culture Change: You can now restore a previous culture to a converted province, or convert a province you hold to a culture that is not your own. - Native Policies: Set your policy for colonial encounters with natives. Are you focused on quick subjugation, peaceful growth or trading advantages? - Improved Espionage: New spy actions allow you to study the technology of more advanced countries and prod your rivals’ subjects towards independence. Just started a Tuetonic Order game after getting late game bored with my Russia playthrough. Ooof. Feels like the first time as Foreigner would say. Got myself in the HRE already though. There are some great looking empires going on here! I just started a Ottoman WC run. I gave this another go and I have since questions. I don't have any expansions. I've played the first 10-20 years of Castile twice now, using the missions to guide me in terms of high level goals. I made a mess of the Reconquista the first time, failing to carpet Granada and learning about something called attrition which proceeding to turn my army into a bunch of corpses. The second time I did better with Granada, but they pulled in Tunis as their allies. I wasn't going to attempt to invade all the way over there. This meant I was waiting for my warscore to tick up, with nothing to do but wait. I'd stripped back my occupying force to the minimum, so attrition didn't hurt me this time, but it was quite boring. Can I expect the same periods of waiting for stuff to happen like in CK2? Should I have buttered up Tunis first so they wouldn't join? In general you should be powerful enough to both take Granada and Tunis. They would be a problem if they put both their armies together, but that isn't happening as easily if you have just a good fleet (and the AI is still not that good at transporting their troops). With Granada sieged down you you could pop over yourself, siege some bigger parts of Tunis down and force them out of the war for money or even a province or two. Just be aware that due to the Berber Traditions the coring will cost 50% more over there. Later on Spain/Castile gets missions to grab certain provinces in North Africa too. I need some advice, please. I've been playing a Muscovy->Russia game for months, and have just made the huge mistake of continuing that game while too ill to concentrate properly. I've made an error in my peace deals and now I'm wondering how to recover. It's ironman so I can't revert to an earlier save. Having picked up my initial achievement goals, I've been working on the 'conquer and core all of Japan as a European nation' achievement. I'm very nearly done, just 5 provinces left. I couldn't take all 5 in my last war because it would have put me over 100% OE, so I force vassalised Japan. Annex them and bingo, achievement unlocked without the need for an extra war. I forgot to check relations first. They hate me. A lot. Massive AE from the conquest of their other holdings during multiple wars. I thought I could work with it. I took them into my war against Ming, improved relations, set up some subsidies, hired a dip-rep advisor (I can't get a AE-burning advisor) and looked at how much of a bonus I'd get from giving them huge piles of cash as a gift. My prestige is at 96. All together, it's not enough. After years of burning AE and fighting together I'm at +66 with minimum trust, and there isn't much left for me to do. It's 1719 so I don't have time to make more mistakes, or fumble around working out my own solution. I considered setting Japan free and then DoWing them once the 5 year truce runs out. The option is greyed out. It says "Cannot release a vassal enforced by a truce". As far as I can see the truce has already expired; the war with Ming was a long one. So I'm stuck with them forever? If I get another 3 goldmines I'll get the "own 10 gold mines" achievement. I can easily get those from selectively grabbing Ming-land. Problem: conquering in that area adds more AE on Japan. I want to get both of those achievements! I'm so close to both and it wouldn't have been a problem if not for my peace deal slip. I'm not so bothered about the achievements themselves, more the strategic goals which they represent. I don't want to fail in goals which I nearly reached simply because I was too groggy to check a screen once. What can I do? 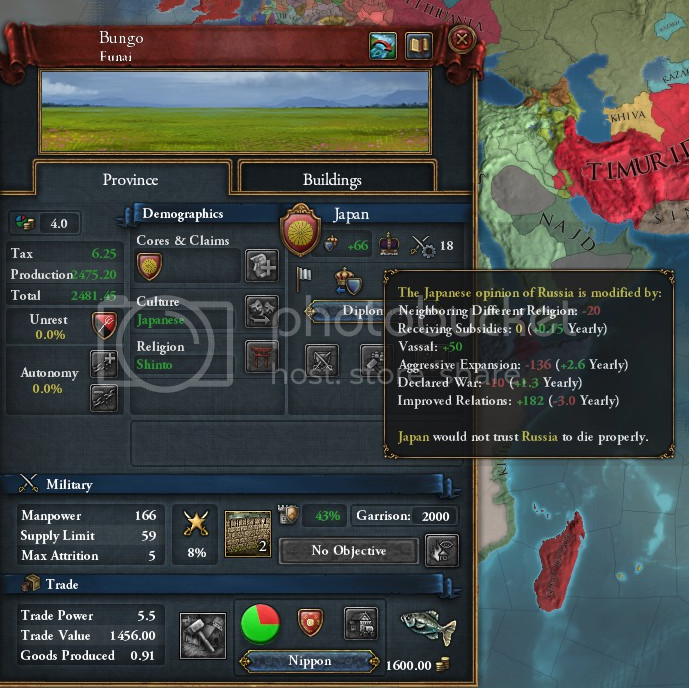 How can I either make Japan like me to the tune of 190 before the game ends, or set them free so I can DoW and full annex? NB: I am playing in 1.9.2 for this particular game Yes, it's that old! No vassal liberty desire and all of that later stuff. Screenshot of the current situation. It's 1719. I'm sure that there's a reasonable solution. I'm just too woozy to see it. 1. I think truces cap out at 15 years. Can you break the vassalisation after that and then DOW? 2. Otherwise, it looks like you can completely burn off that AE in 52 years (136 negative modifier, reduced by 2.6 per year), which would take until 1771. In practice, you might be able to do it sooner. You only need +190 relations, and your -10 "Declared War" will be long gone by then. With +200 improved relations, +50 vassal, and -20 neighbouring different religion (total +230), you can still have -40 from AE and still be at +190. You can bring your AE down to -40 in 36 years, which would take until 1755. That gives you anywhere from 40 to 60 years, first, for the diplo-annexation to take effect, and subsequently, to core Japan. Thanks. This worked. I was able to integrate Japan, although it took nearly 20 years of annexation on top of the AE cooldown time. I surgically snaffled my last few gold mines without doing wholesale conquest to minimise AE. Made it with 35 years left on the clock. I really shouldn't play EUIV when I'm feeling so grotty. Thing is, 1.14/Cossacks hits tomorrow and I really like a bunch of the changes. Particularly the new diplo/AI interaction system. I want to try it out, see if it does an Art of War and wholly improves the game for me, or see whether it's another '3 steps forward and one step into a thorn bush' version. I've been playing this particular 1.9.2 Muscovy save for half a year! Far too long to leave it as unfinished business if I find 1.14 to be more to my tastes and finally move on from 1.9.2. Kazakh is a vassal which I'll annex if I keep playing. Persia, Kiva and Garazmakh (sp?) are all my marches. I wanted buffers to prevent the Ottomans forming a border with me and starting a war. Europe wasn't an area which I wanted to be active in outside of grabbing a bit of land there at the start of the game. Too many wars to plod through when combined with my Eastern ambitions. I would have shattered Ming further if I'd not decided to avoid wars as much as possible after making that silly mistake with Japan. Too much risk of doing something else dumb. Shame; I could have eaten most or all of Ming by now if I'd kept on with it. The Timurids too. Admin efficiency is quite the beauty! I suppose those will be my final borders as there are no more goals which I can achieve in the remaining timespan. It's the first long, blobby EUIV game which I have done. Normally I go for objectives which see me topping out at under 100 provinces in total. It was fun for a change of pace but my next few games will be based around smaller scale goals. Congratulations on your conquests. Glad things worked out. Oddly, the Cossacks feature that most excites me is a minor one: the optional alt- history scenarios that will be added to the random New World generator. Finding the survivors of Vinland? Discovering a technologically advanced empire? Cool! 1.14/Cossacks patch notes are now out. Pretty much a concise recap of the dev diaries. Yup, I figured a new DLC was just released. Too many people on my friends list were playing EUIV in the middle of the day today for it to be otherwise. Very cool - there were definitely a few takeovers that I didn't realize happened, and I was also amazed at how fast some of those empires spread. Quick question about the DLC - can you take a Horse Lord playthrough from CK 2 and easily port it over with the Cossacks expansion? And has anyone found benefits for doing so? (Eg, if you port over a reformed Viking game you get certain bonuses as a Scandinavian country). I'm still learning EU IV and am playing as Russia (started as Muscovy). I am having a hard time understanding the effect of the market place on trade income. I made a note of my current income from trade and it was 12.33. I've built several market places in my home trade node as well as others I am forwarding trade power from. After building the marketplaces, and waiting for them to come on line, my income from trade has gone down to 9.36. This is exactly opposite of what I would expect. Does anyone have any idea what I might be doing wrong? Your income from a node is the total Trade Income from all the provinces in the node split up in proportion to all the countries' relative trade power in the node, so if another country's TP increases, your income will go down. I have to say, the effect of marketplaces seems minor most of the time. The Seville province gets a big boost from a market place, but that seems unusual. A marketplace adds 50% to your local (i.e. provincial) trade power. If you built them in your home node, where you collect trade income, you won't see any benefit since you don't steer trade from your home node. Ideally, you build them outside your home node (preferably upstream) to boost trade steering going downstream to a collection node. Also, since it is a percentage gain, you would ideally build them in provinces that already have strong trade power. Province A has 1.20 trade power. Building a marketplace there would boost that to 1.80. Province B has 2.20 trade power. Building a marketplace there would boost that to 3.30. Marketplaces used to provide a direct boost to trade income, but that got changed in the patch that came out with the Wealth of Nations DLC. I highly suggest reading the wiki entry on trade as trade is pretty complex. Seems like you just got hurt by other circumstances, jarmenia. Adding marketplaces in isolation would have helped with your trade income, but there's always so much going on that it's tough to isolate experiments properly to see cause and effect. Unless you're going for a specific trade-focused strategy, Temples and Workshops should have a much higher priority in general. Any provinces with a boost to local trade power (like a center of trade) should get a marketplace, though. Trade power also helps when collecting, assuming that you aren't the only country with a presence in your home node, since TP determines what proportion of the income in the node you collect. Thanks for the advice @tboon and @Gunner. You're right of course Gunner, not sure what I was thinking. Sorry for the bit of a bum steer I gave you jarmenia. Still would rather use marketplaces upstream to steer trade down to a collection node though. Tboon / other wise EU4 folk - how critical / good were the last two expansions (Mare Nostrum and Cossaks)? 1.18 is going to do away with the tech penalty for non-western tech groups! Instead there will be up to 7 institutions that will pop up over time that have to be adapted in your nation. So one is colonialism, which is going to pop up in your ports when you start to have colonial nations and it will slowly spread through your nation. If the institution has spread far enough you can embrace it, removing the penalty and giving you a bonus (like +1 free leader). Gotta say, I can't wait for the patch now after the last patch kinda left my hanging dry. OK EUIV vets, with the Paradox sale happening now and the Steam summer sale right around the corner, it's time for everyone's favorite game: what DLC should I get? I currently have none of them, just plain ol' vanilla EUIV. I haven't played much, just major European countries, so I'm not sure what exactly I'm interested in. I did like the exploration/colonizing aspect when I played Castile and Portugal, so maybe some more of that, but otherwise I have no preferences. Enlighten me! Rights of Man - rulers have personalities and traits now, more ways to boss subject nations around during wartimes, great powers can do extra stuff and a grab bag of other things. My take - If you want to play in East Asia (Ming, Japan, Korea, et al), by all means grab this. If that area does not interest you, then I am not sure golden ages makes this essential. The radical changes to playing in Asia are nice, but the golden age/ages mechanic tips this over to Tentative Buy . Third Rome - similar in scope to Mandate of Heaven, except for Russia (Muscovy, Novgorod). Except where Mandate had some stuff for other regions/countries than its primary target, Third Rome really does not. My take - If you like playing as Muscovy or another country in that area, then grab this. If you are not going to play there, then no need for this. Due to it being hyper-specialized, I am going with Pass. I would say Common Sense, The Art of War, and Wealth of Nations are almost no-brainers since they radically beef up and extend existing systems in generally fun ways. The rest are a bit more hot or miss, in my opinion. The music packs are fine and usually good, but I almost always turn the music off so I don't consider them worth picking up. The rest of it is not necessary and I would recommend skipping. Unless you want more models or portraits or whatever, which is fine and they are usually cheap but I don't think they are worth it. I am sure other folks have other thoughts, I would be interested to hear what they are. With the upcoming Steam sale, I wanted to ask y'all what DLC I should get for EU 4. I only have the base game. EDIT: Nvm...I should have read the post RIGHT ABOVE THIS ONE.